The Troops Need Your Help, NOW!!!! Eighteen (18) American military veterans successfully commit suicide every single day. More than 30 attempt to commit suicide each and every day. These numbers don't include the veterans who drink themselves to death, overdose on drugs, or get murdered in response to psychotic, self-harmful behavior. Nor do these numbers include the veterans who die in ambiguous 'accidents' in cars, at work, away from home, or those whose bodies are never found, whose lives are no longer missed. Suicide and murder are what we're offering. Stop the killing abroad so we don't have to face the killing at home. For more on the killing at home go here or here. The VA has set up a 24-hour suicide hotline for around-the-clock access to mental health professionals. The number is 1-800-273-TALK (8255). To learn more about PTSD — visit the National Center for PTSD website. If you really want to support the troops, work to bring them home rather than letting them risk their lives because you're afraid to speak out. With the media totally owned and co-opted by corporate interests, citizen journalists have become our eyes and ears. Watch this for a look at how those who 'support the troops' really feel about our soldiers. The power of the Citizen's Press. This is a fine example of how Main Stream Media ought to work but doesn't. Wednesday Senator Russ Feingold (Democrat of course, from Wisconsin) demanded that the Army look into and repair the horrific conditions at Ft. Bragg, as exposed by one of the Senator's constituents (see video above). Low and behold, the Army immediately responded by repairing the derelict facilities. DID YOU GO shopping in the past week? If so, you probably brought home some plastic. Plastics are everywhere - in our office supplies, our refrigerators, our cars, our buildings, our clothes. This proliferation of plastic represents the ingenuity and enterprise of modern industry. Where this ingenuity has led us, though, is not to a bright future. Plastics were discovered in the 1860s. Celluloid, made of treated cellulose, replaced amber, horn and ivory for buttons, knife handles, combs, even billiard balls. Thousands of elephants' lives were saved. Why, then, aren't we celebrating the era of synthetics that followed? It starts with non-biodegradability. Plastics are long-chain polymers that resist breakdown by any organism. Experts on marine plastics believe that every piece of plastic ever made still exists. Nylon may be an exception to this rule. A 1997 study found that a white-rot fungus could break nylon down. Should these results apply in the field, our nylon cast-offs, if they stay on land, have a chance of re-entering the cycle of life, death and decay. The rest of our plastic inventions do not. In 2006, the United States produced 56 million tons of plastic. What are we doing with these tons of materials when they complete their useful lives? In 2001, a mass of plastic debris in surface waters of the Pacific Ocean was estimated to be the size of Texas. Now it may be as large as the continental United States! In these waters are one million particles of plastic per square kilometer. Around the world, creatures of all sizes are ingesting plastic debris. Jellyfish, seabirds, whales, sea turtles, lugworms - all are taking in particles, shards and strips of plastic. Nobody is happy about this. The American Chemistry Council has launched a $5.4 million campaign to promote proper disposal of plastics. If we can stop littering and recycle instead, it asserts, our crisis will be solved. But other problems are built into plastic. - Dispersal. Materials escape throughout plastics' lifecycles: emissions during production; abrasion during use; off-gassing and leaching into products; discarding when pieces are contaminated or worn out. Consider the plastic recycling bin that you drag across the pavement. All the particles that are worn off don't disappear; they go into soil and water. - Dependence. When California cities began to consider restrictions on plastic bags, the Progressive Bag Alliance began to promote recycling instead. In 2006, its best estimate of recycled content possible in plastic bags was about 17 percent. Recycling bags may lower the amount of petrochemicals used for production, but does not end our dependence on them. - Down-cycling. In most cases, plastic articles get reprocessed into lower-grade products. Plastic jugs get made into things like flower pots and pails, not new jugs. These secondary products are usually not recyclable. Recycled plastic bags often go into wood-plastic lumber, which abrades and off-gasses during use, emits toxic fumes if burned and does not get recycled when a property is remodeled. Consider, too, the sawdust. - Danger. Many modern disorders, including asthma, cancer, diabetes, obesity and premature puberty, are associated with chemicals in plastics. We are just beginning to learn about the effects of accumulating synthetics in our bodies. Do we want to keep exposing ourselves to more of these chemicals while we await further research? A prudent approach to this crisis is simple: Avoid plastic wherever and whenever you can. Need ideas? Check with Earth Resource, Greenpeace, or Green Sangha. The same creativity and drive that accidentally produced this crisis can be harnessed to reverse the waste and pollution. All it takes is your desire to do something now. Stuart Moody is on the Executive Committee of Green Sangha, a spiritually based environmental action group with chapters in Marin, the East Bay & Sonoma County. How McCain behaved when he was a prisoner is key. McCain is probably the most unstable man ever to have got this close to the White House. He’s one election away from it. Republican senator Thad Cochrane has openly said he trembles at the thought of an unstable McCain in the Oval Office with his finger on the nuclear trigger. What if a private memory of years of collaboration in his prison camp gnaws at McCain, and bursts out in his paroxysms of uncontrollable fury, his rantings about “gooks” and his terrifying commitment to a hundred years of war in Iraq. What if “the hero” knows he’s a phony? Doug Valentine has written the definitive history of the Phoenix Project in Vietnam… Now Valentine has picked up the unexploded bomb lying on McCain’s campaign trail this year. As he points out, he’s not the first. Rumors and charges have long swirled around McCain’s conduct as a prisoner. Fellow prisoners have given the lie to McCain’s claims. But Valentine has assembled the dossier. It’s devastating. We’re running it in our current CounterPunch newsletter and we strongly urge you to subscribe. Some excerpts from Valentine’s indictment. “War is one thing, collaborating with the enemy is another; it is a legitimate campaign issue that strikes at the heart of McCain’s character … or lack thereof. In occupied countries like Iraq, or France in World War II, collaboration to that extent spells an automatic death sentence … The question is: What kind of collaborator was John McCain, the admitted war criminal who will hate the Vietnamese for the rest of his life? “Put it another way: How psychologically twisted is McCain? What actually happened to him in his POW camp that twisted him? Was it abuse, as he claims? “McCain had a unique POW experience. “…McCain was held for five and half years. The first two weeks’ behavior might have been pragmatism, but McCain soon became North Vietnam’s go-to collaborator… McCain cooperated with the North Vietnamese for a period of three years. His situation isn’t as innocuous as that of the French barber who cuts the hair of the German occupier. McCain was repaying his captors for their kindness and mercy. War Hero or Immoral War Apologist? "624787." In his first national campaign ad for president, Sen. John McCain is shown reciting his rank and serial number as he lies in a Vietnamese hospital bed as a prisoner of war. The ad describes him as "a real hero." Let's be clear: Senator McCain is running for president as a war hero who plans to win the campaign based on character and honor. On the surface, it seems churlish to critique the idea of a war hero. And criticizing a tribute to courageous and self-sacrificing soldiers would be disrespectful. But inextricably tied to the idea of the war hero for president is a discussion that goes beyond individual soldiers or prisoners of war, such as Mr. McCain, to the wars they fight and what their role in the war says about their moral merits as national leaders. This turns out to be surprisingly problematic. We need to distinguish the war hero from the war. Fixed ideas about war heroes get into what we call "morality wars," crucial struggles about which values should prevail, who should be admired and for what qualities. When we call Mr. McCain a war hero, we engage in moral discourse about the Vietnam War - and now, Iraq. We also give Mr. McCain - currently the country's most celebrated war hero - the ultimate political weapon: power by virtue of heroism and the ability to discredit opponents as weak or unpatriotic. The public has treated Mr. McCain's record in Vietnam and his status as a war hero as something unchangeable. But placing his sacrifice beyond the pale of criticism also implicitly places the cause he served beyond the pale, and that hushes important dialogue. Mr. McCain's heroism stems entirely from Vietnam. Mr. McCain was brave in captivity, but he and his fellow pilots dropped more bombs on Vietnam than all those dropped in World War II, leading to the conclusion that "we had to destroy Vietnam in order to save it." He did not acknowledge the war itself as immoral. If he had engaged in such "straight talk" about the war, or if we had a more enlightened concept of heroism, he might not be getting so close to becoming the next president. This language of war heroism is used unfairly to confuse unjust wars and their architects with the honor of brave soldiers. By promoting the idea that Vietnam was an honorable war and denigrating anti-war Democrats as too weak to "stay the course," Richard Nixon won the presidency in 1968. He then kept the war going for another five futile years. Playing the war hero card has long been a political strategy to elect Republicans, legitimize imperial wars and portray Democrats and peace activists as weak, cowardly or traitorous. Sen. John Kerry, also a courageous soldier in Vietnam, was "Swift-boated" as a traitor because he became a peace activist. Republicans even did the same to Daniel Ellsberg, a real hero of the Vietnam era. Mr. Ellsberg was a war planner who turned against the war and in 1971 released to The New York Times the "Pentagon Papers," the military's internal and damning history of the war. But as there are no peace heroes in the American moral discourse, President Nixon tried to indict him, and many still brand him as a traitor. Most of the presidents in the decades after the Civil War were Republicans, the majority of them generals who ran as war heroes. In the 20th century, Republicans continued to serve up war hero candidates such as Theodore Roosevelt, Dwight Eisenhower and George H.W. Bush. And now we have John McCain. If the Democrats are to win elections in the 21st century, the key is to finally engage in straight talk about war and war heroes. First, they must renounce the morality of militarism. Second, they must be clear that the architects of unjust wars are not honorable or heroic but immoral moralists, those who wage evil in the name of good. Third, they must create a new language of heroism. Brave soldiers in just and unjust wars may be heroes, if we refer purely to personal courage and sacrifice in battle. But it is critical that we recognize that those who oppose dishonorable wars are also heroes. Surely, their courage should also qualify as a character virtue for the highest office in the land. The peace hero - even more than the war hero - should be the ultimate moral force in the world we now inhabit. Charles Derber and Yale Magrass are coauthors of "Morality Wars: How Empires, the Born Again, and the Politically Correct Do Evil in the Name of Good." This article originally appeared in The Christian Science Monitor. ...the stars of "The Bucket List"--Jack Nicholson & Morgan Freeman. From Sunday's New York Times we learn that 1984 is alive and well in the Bush defiled White House. Using corrupted, greedy and immoral sycophants who once served as high ranking officers in the US Military, this administration has turned lies into a palatable consumer friendly gruel that has cost us the lives of our young and most of our national treasure. Instead of a band of brothers, we see a seething cesspool of self-interest, where the lives of young soldiers are traded for government contracts. If you ever thought there was anything noble about America's military tradition you owe it to yourself to read this article in the Sunday Times. If you ever thought there was any part of integrity or professionalism in the mainstream media, this article will be most illuminating. Why are so many men afraid of Hillary? It's time to pry the gun (I know, gun=fun, rifle=fighting) from John Carters's cold dead hands, 'cause Mose bit the dust yesterday. I'd cry if I cared but I don't. 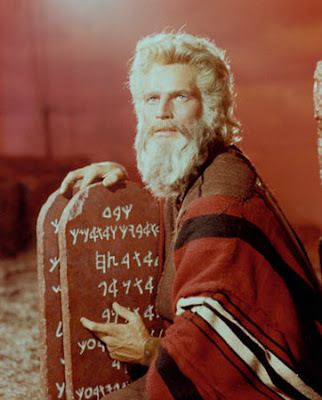 Charlton Heston was a pathetic actor and an even worse human being.